Can the Tennessee Titans and Marcus Mariota Bounce Back and Defeat a Jay Cutler and Jay Ajayi led Dolphins? In one of week 5’s more interesting matchups, the Tennessee Titans travel to Miami to battle the Dolphins. Coming as a surprise, the Houston Texans dominated the Titans last week in a contest where the Titans lost Marcus Mariota. In a similar fashion, the Dolphins are coming off a crushing defeat to the New Orleans Saints in London. With two defenses struggling to start the year, this game could become an offensive shootout. After suffering a hamstring injury in week 4, Coach Mike Mularkey called Mariota day-to-day. Since his week 1 finish at QB6, Mariota has not finished higher than QB16 the last 3 weeks. Although this isn’t ideal production, all skill players need to be downgraded if Mariota sits . Dealing with a hamstring injury himself, DeMarco Murray hasn’t been the fantasy stud people expected. He only has 1 game above 100 yards rushing and is stuck in a timeshare with Derrick Henry. He failed to eclipse 14 carries in each game this year. Rishard Matthews is quietly averaging 8 targets per game to start the year. This has led to consistent flex-worthy fantasy production. If Mariota plays, continue to fire up Matthews as an upside play. Delanie Walker remains one of the NFL’s more consistent tight ends. Currently receiving a 22.6% target share, Walker remains an every week starter at the position, whether or not Mariota plays. Before last week’s blowout loss Henry’s carries had increased every week to start the season. Now in a full-blown time-share, Henry warrants flex consideration every week. 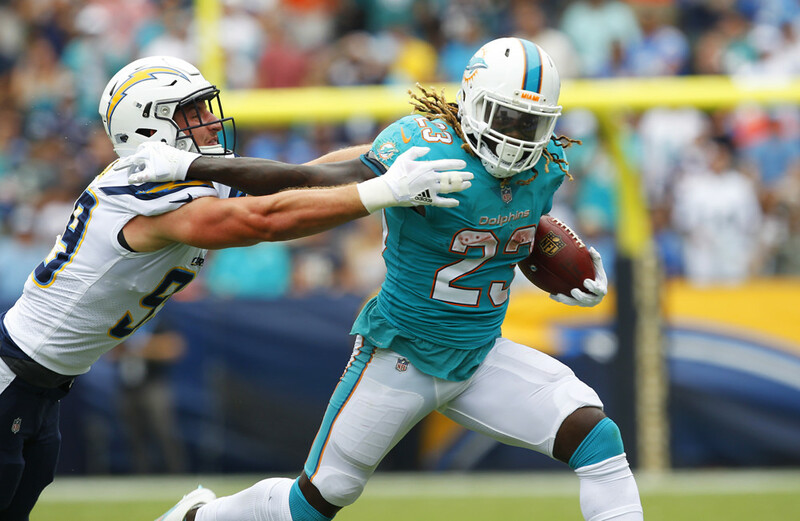 After carrying the ball 28 times for 122 yards in week 2, Jay Ajayi has not eclipsed 12 carries or 46 yards in his last two contests. While he has been dealing with an injury and an inept offense, he remains a must start against a poor Titans defense. Following his 13-reception game in week 1, Jarvis Landry has also struggled. With 6 receptions each the last two weeks, Landry hasn’t passed 48 yards. With the Titans’ porous secondary on deck, Landry has the ultimate get-right matchup. The lone bright spot in the Dolphin’s offense the past two weeks, Parker draws a Titans’ secondary that allowed Deshaun Watson to throw for 4 touchdowns. This makes him a strong WR2 with upside this week. Following an abysmal start to the season, Jay Cutler has not finished higher than QB18 in any week. While the Titans are a good matchup, Cutler was unable to capitalize on an equally juicy matchup against the Saints last week. Until he shows signs of life, Cutler should remain on the waiver wire. Normally unusable in fantasy, the Dolphins are a defensive streaming option this week due to Mariota’s injury. If Mariota misses the game, fire up the Dolphins defense with confidence.